Hello. My pleasure to be one of the few bloggers that join the McDonald's team earlier this week for dinner to understand more about RMHC and of course, a task to raise awareness for them. Remember the donation box shaped like a house at the McDonald's cashier where we all wondered there the money goes to? Here's your answer - To the Ronald McDonald's House Charity. The charity organisation started in 1974, the initiative aims to keep families together, mainly for sick children to have their parents by their side. That brings to another point, YES THE FUNDS GOES TO CREATING "HOUSES" NEAR THE HOSPITAL. RMHC saw many struggles of parents with critically ill children - be it emotionally/physically/financial. So what's happening locally ? We have a 4 bedroom Ronald McDonalds house within the premises of NUH and only 4 families get to stay in there at a time. There's a living room, kitchen, laundry area,reading room in the house. Meals were also provided to the families who stayed there. That really helped both children and parents a lot. Parents who stayed there are able to shorten the travelling time to and fro from the hospital and its cost while the children are able to access their parents any time or at any emergency. And that's the money you put into the house shaped box goes to. Each Happy Meal contributes 5 cents to the charity too! That may not a lot of money but it means a lot to them. I bet you didn't know about this right!!! Actually me too, but I'm glad I did now and even happier that I am tasked to spread the love to you who are reading this! And we should make it happen la. But actually they are at planning stages for a Ronald McDonald Family Room at NUH for families with children who are receiving treatment in the Paediatric Intensive Care Unit of the hospital. So your main point is ? BUY A PAIR OF SOCKS! Ya, together with RMHC, we want you to buy a pair of socks. Remember those Ronald smiles that McDonald's sold for the previous years at $2 each? Actually it was also to raise awareness for RMHC (you don't know right...) This year, the Ronald's smiles has been replaced by the socks. 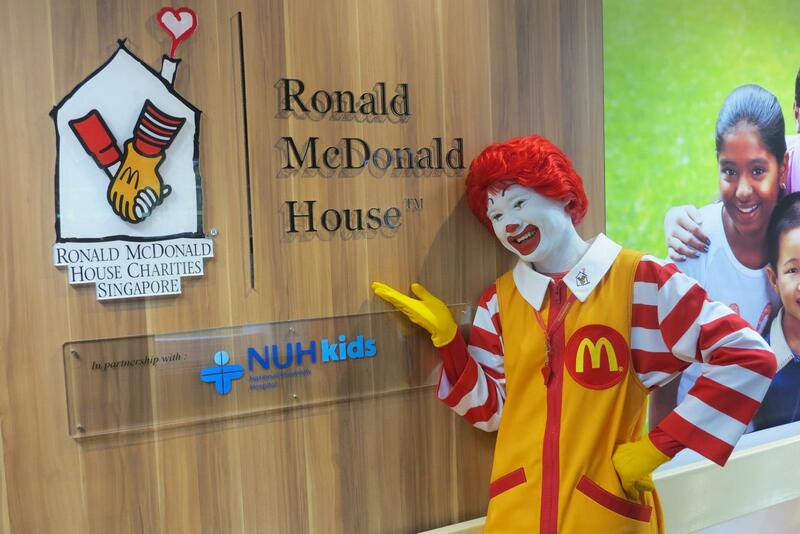 Coincidentally, Ronald wears the same socks too and also it is the 40th year anniversary of RMHC ! To commemorate the anniversary, many fun-packed activities has been lined up. 1. MAKE A DONATION AND SHOW YOUR STRIPES. From 15 October to 28 October, you can make a donation to purchase a pair of red and white socks via GROUPON at $10/ $20/ $50. The socks look like the following where you can also wear it Christmas and Chinese New Year. First sentence is official from my press release while the second line is my personal creativity. You may, not take me seriously. 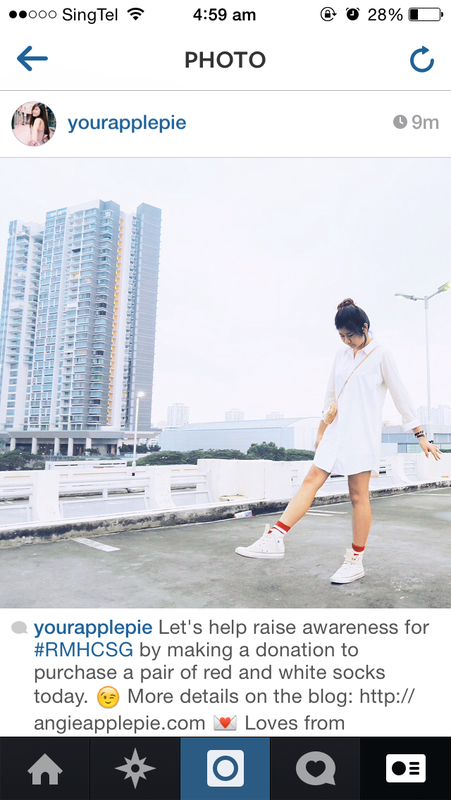 Sporty bloggers wearing the socks to show their support! But here's what I did! An #ootd shot #forRMHC #RMHCSG that's on my instagram! Actually you can do anything you want as long as it is red and white. I suggest you buy the socks and think of something creative that you can do out of it ! 3. JOIN THE MCHAPPY DAY 2014 - 16 NOV 2014. Mark your date ! It's McHappy Day, we can all have a happy meal with the happy people. Not really actually, the McHappy day, happening this 16 Nov, would be held at Tampines Mall from 1pm to 5pm. 600 volunteers will be there in a McHappy Day Walk where they will wear the red & white striped socks and selling them (new ones of course) across Singapore. Everyone is welcome to join in the fun where there will be balloon sculpting, face painting games and more fun activities! Remember to donate and help spread a word! See you at the McHappy Day!